As gas prices continue to rise from now until Labor Day, one website says it knows the best day of the week to get a good deal on gas. GasBuddy.com and its phone app help drivers find the lowest-priced gas in their area. 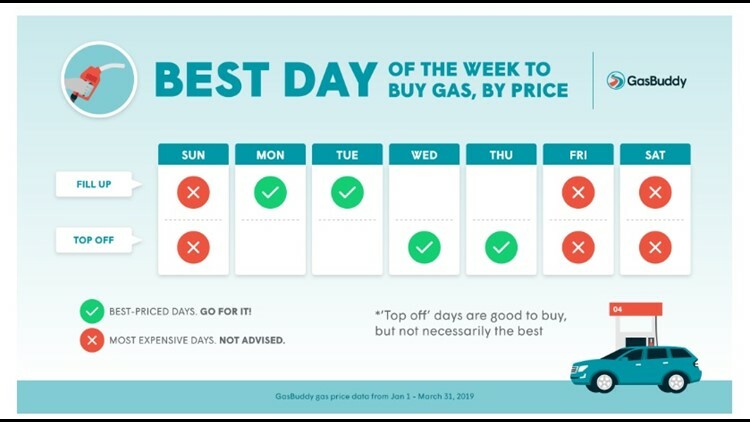 According to a press release sent out by GasBuddy, it analyzed gas price data from January to March 2019 and found Monday offered the lowest average gas price in 30 states, making it the best day to fill-up. "Finally, consumers have reason to be motivated about Monday since it offers the biggest savings on gasoline and little wait, if any, to fill up," says Patrick DeHaan, head of petroleum analysis at GasBuddy. "As the week progresses and our excitement builds for the weekend, gas prices also tend to rise." The study also showed that while Saturday is the most expensive day to buy gas in 16 states, Friday has the most expensive increased average price of any other day of the week. "Sundays represented the third-worst day to fill up, bringing our study to a conclusion that weekends are the worst time to fill up. You might as well flush money down the toilet," sad DeHaan. Pat Moody with Triple-A Public Affairs said he could not confirm GasBuddy’s information on specific days to buy gas but agreed that there is a trend for gas prices to rise through to Labor Day. "This is the season where refineries switch from winter to summer blend (more environmentally friendly). As demand holds steady and inventories continue to tighten, motorists continue to see gas prices increase across the country," said Moody. What about waiting in line? 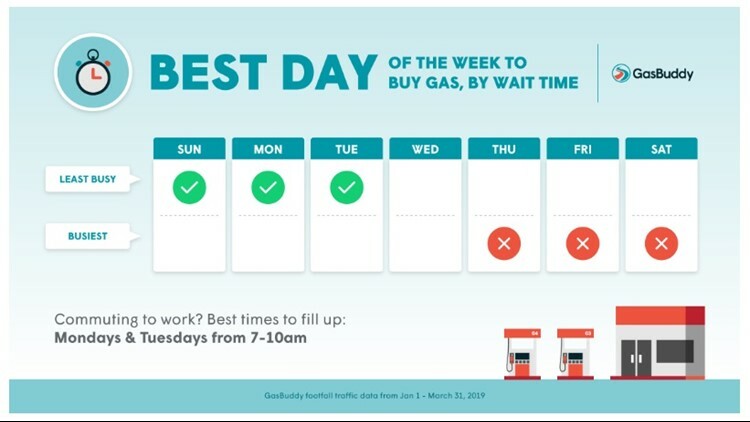 GasBuddy also analyzed GasBuddy foot traffic data in the same time-frame and found that gas stations across the country are least busy on Sundays, followed by Mondays. Friday is the busiest day, with 5 p.m. being the busiest time for gas stations nationwide.